Do you know about Bathtub Party Day? Well, it’s a hashtag holiday that takes place on December 5th of every year. While it’s common knowledge that cats don’t usually enjoy bathing in water, that hasn’t stopped them using the holiday as an excuse to get all in their humans’ bathtubs. Here are five cases of cats celebrating Bathtub Party Day in hilarious and weird fashions. Some cats have a strange attraction to porcelain, like Whampus here, who enjoys nothing more than to lounge around and stretch out in an empty bathtub. Oh, and if you were wondering, Whampus also claims the “official” title Prince Of Tubs. These two inquisitive young tuxedo cats have become fascinated with the bathwater in their human’s soak. Dipping a paw in is obviously the best way to fathom out what’s going on. Presenting the bathtub as hiding spot. Perfect for peeking on your human without detection. Curiosity usually gets the better of all cats, which might be the only explanation as to why there’s a small clowder of kitties hanging out in this tub. Finally, check out this resourceful feline who resides out in Germany and came up with a way to join her human for a relaxing soak in the tub without getting herself wet. 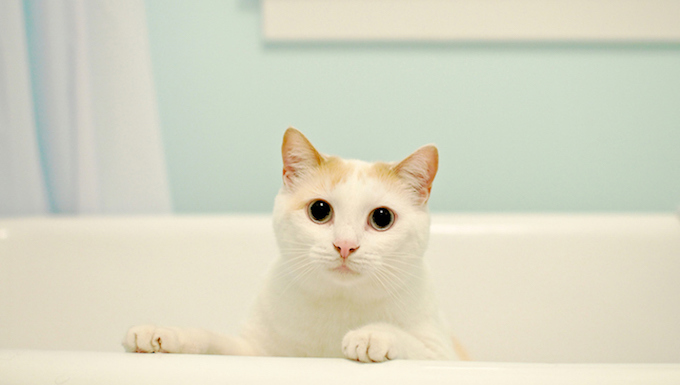 Does your cat act strange around the bathtub? Tell us all about it in the comments!